(323) 456-3572 wait for pick up after giving name or leave voice mail. Floor Plans & Photos - Link to #203 at 3717 Vinton Select link at very bottom of this page to view layout of all units. Smoking - All units and common areas are being designated as no-smoking areas as contracts renew. Move In Costs with acceptible: credit record, income coverage, employment stability, and confirmed rental history. Security Deposit = One month's rent with acceptible credit & rental history. Rental Procedure - Open this link for detailed description of rental contract. Scroll down for link to rental applications. The first step is for each prospective occupant / renter to complete and submit a signed rental application. A rental application is required from each person interested in occupying apartment unit. 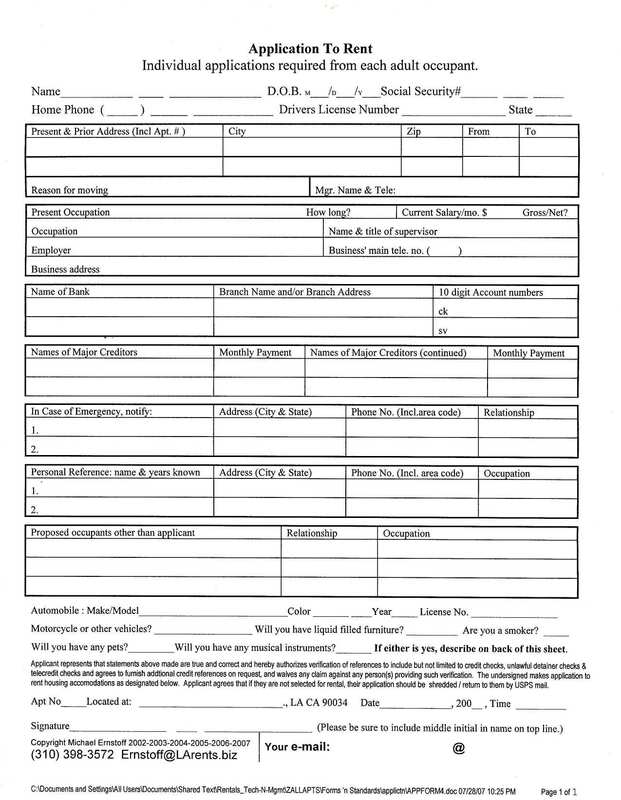 Rental applications should be hand delivered to rental agent or sent electronically as encrypted documents separate from password information. .
Click on this link to display image of rental application. Management will review submitted applications and run credit checks on those meeting income and rental history standards. There is no charge for credit checks. Applications from unsuccessful rental candidates will be shredded unless applicants ask for them to be returned. The second step is to submit a good faith deposit. The successful rental candidates will be asked to deliver a good faith deposit (personal check ok) for one quarter of a month's rent. In return, the owner / manager will provide a deposit receipt indicating the key terms of the rental agreement. On acceptance of the deposit, the unit will then be withdrawn from the rental market and held for the rental candidate . The third step occurs on or before the move in date. The successful rental candidates will be asked to deliver funds in the form of hard money (cash, money order, cashier's check) for the balanace of the first month's rent and for the security deposit. The owner/manager and the (now) renters will all sign the formal lease agreement and formally acknowledge that various notices have been provided. On completion of this step, the tenant will be provided with keys to the unit. The fourth step occurs once possession has been granted. It is the obligation of the incoming tenant to have the electric power and gas utilities switched over to their name. The gas company may required that someone be in the unit when the gas is turned on. Do not leave completed rental applications in uncontrolled locations as they contain sensitive personal data. Applications of unsuccessful applicants will be shredded unless they specify otherwise. Emergency Procedures for Injured Workers Open link below for detailed instructions. 3106 Bagley, 4006 East Blvd and 3732 Westwood are shown for referral purposes only. They are no longer operated by Ernstoff Properties.